How Can I Over-Winter My Container Plants? 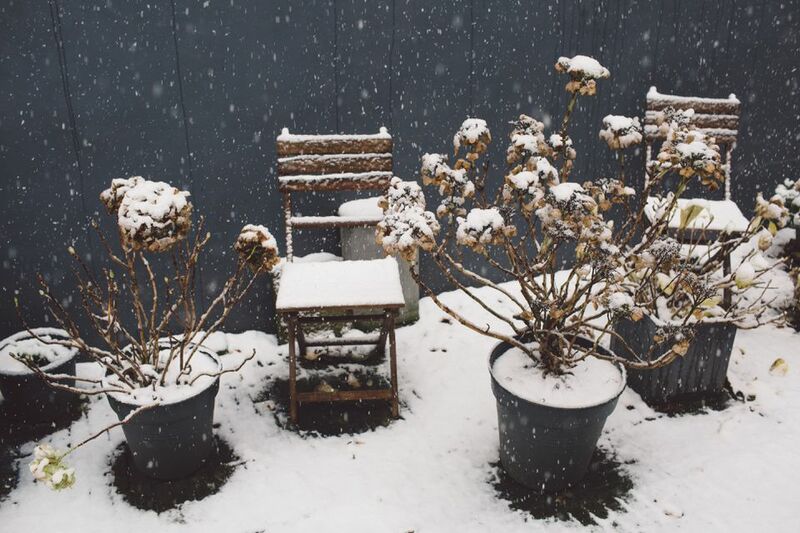 If you have container gardens of perennial plants, you may be tempted to leave them out during winter. However, plants are always better off in the ground during winter in freezing climates. If at all possible, find a spot in your garden to either plant the plants temporarily for the winter or bury them pot and all. Mulch with 2-4 inches of bark or leaves, once the soil has frozen. If you must leave your plants in containers, you’ll need to provide some extra protection. In general, plants can survive in containers if they are rated at least 2 USDA Hardiness zones lower than the zone you are gardening in. So if you are in Zone 5, you’d be safe with plants labeled hardy to Zone 3, but how many of them are there? However, gardeners in Zones 7 and 8 can get by with minimal loss on chilly nights if they stick to the much wider variety of plants considered Zone 5 and above. Another thing to consider is that once the ground freezes under the container, water cannot escape the bottom of the pot. The container will thaw before the ground does and if you get a few rainy days, the water will stand in the pot, either rotting the roots or turning into an ice cube when the weather chills again. Avoid this by tilting the pots slightly. And finally, make sure your container is strong enough to make it through winter. The more porous your container is, the more likely it will crack during winter. Materials like untreated terra cotta can absorb water, which expands when frozen and cracks the pot. The more soil in the pot, the better insulated the roots will be. If possible, you could slip the existing container into a larger container and fill the side with soil or mulch. Cluster several containers together and move them to a sheltered spot, such as near the house or south-facing wall. Encircle the containers with chicken wire and fill with leaves or mulch. Once the ground freezes, add mulch to the tops of the plants. Consider using a cold frame or create a makeshift cold frame by surrounding the containers with pales of hay and covering them with an old window or glass door or a sheet of plexiglass. Keep an eye on your plants if the weather warms. It can heat up quickly under glass. Lift the cover if temperatures are going above about 40 degrees F. and remember to close it at night. For marginally hardy small trees and shrubs, you can protect them from the drying effect of frigid winds by driving 3-4 stakes around their perimeter, about 8-12 inches from the branches, and then wrap them with burlap. Don’t let the burlap touch the leaves or needles or they could suffer more frost damage than if left unprotected. You could use a cage of chicken wire instead of the stakes. Even with all your best efforts, you may lose a plant or two to circumstances beyond your control. But you’d be surprised how many will make it.